So while we SAGs were up the North Shore in our cozy little cabin, we did things we might not always have time for at home. 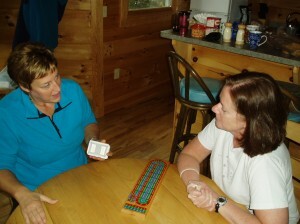 Below, Pat, who invented the game of Cribbage many years ago, teaches Gail how to play. Fifteen-two, fifteen-four, fifteen-six, a pair is eight and one for nobs is nine. Go. Because Gail is so brilliant, she caught on to the game within a few minutes. Three of us played several games while we were there, and it made me want to dig out one of Michael’s Cribbage boards and challenge him to a few games. It’s been a long time since he and I have played on the carved bone board we got in Alaska, but we’re old now so I think it’s an appropriate way to spend our evenings. 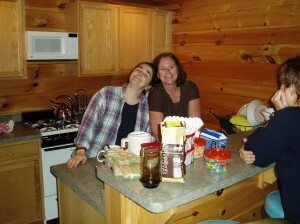 Our little kitchen bar was always well supplied with snacks. SAGs snacks. And as you can see, SAG smiles were in abundance as well. We had M&Ms, peanuts mixed with candy corn which really does taste like a salted nut roll, coffee, chai tea, Honeycrisp apples, a myriad of carbonated beverages, and Pat’s homemade peanut butter and chocolate bars. Which tasted heavenly with a cold glass of milk. And when you’re away from home and don’t have laundry and paperwork calling your name, and there’s no television to zone out in front of, and your housework and homework is waiting patiently until you return, you have all the time in the world. 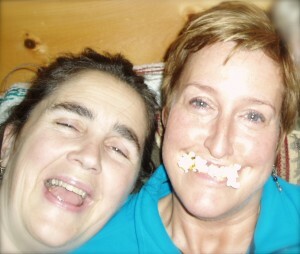 Time enough to engage in relaxing activities such as…..watching popcorn pop. Which is what Lorna and Gail are doing below. Young women of the world, take hope! You have no idea what thrills await you in middle age. These are professional women in the photo below. But sometimes girls (even professional girls) just wanna have fun. 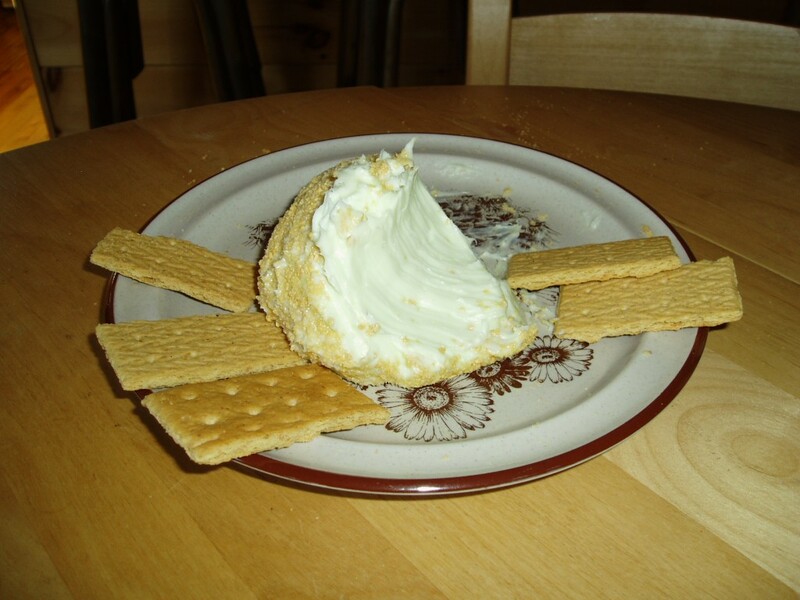 Lorna made a key lime cheese ball and rolled it in graham cracker crumbs. 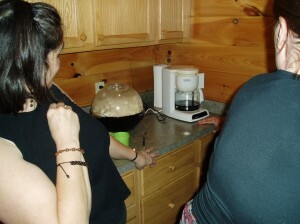 We used graham crackers to scoop into it – very yummy! 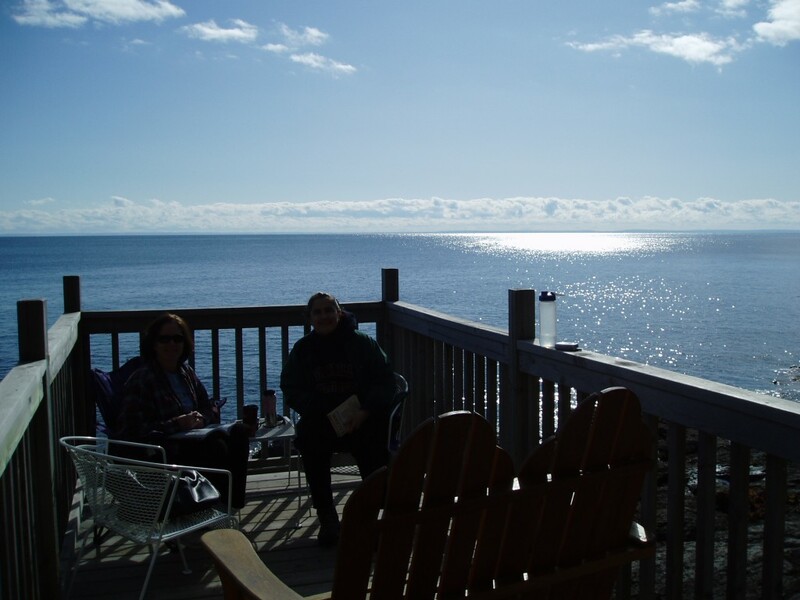 This lovely deck was built right on the shoreline of Lake Superior, and we sat down here in the sun. The wind was chilly, though, so we had to sit by the Lake in increments. Gail brought her Beth Moore Stepping Up Bible study down to the deck and we talked about the Psalms of Ascent, and how song/music is the fluent language of the soul. There may not have been any televisions or radios at Stonegate on Superior, but you can bet all four of us had our cell phones in tow. Below, Pat talks on hers while sitting by the fire pit we planned on visiting after the sun went down, but never did. Please don’t pity us. You had to have been there. With lots of leisure time, the SAGs were able to quilt, crochet and read. We played a quiet game of Scrabble and wondered whether or not faxes is an abbreviation. We also had story time with Miss Lorna, which I’ll talk about in Part 3. And we had Tom Cruise’s Spaghetti Carbonara for dinner. And we gave foot rubs and tried to watch a movie on Gail’s laptop but abandoned that idea when our audio trouble couldn’t be fixed. And we had Culver’s on another night for an early dinner (Butterburgers and onion rings and a pumpkin shake.) Since there are no In-n-Outs in Minnesota, Culver’s is the next best thing. And we talked. And talked. And cried. And cried (at least I did). And laughed. And we even did a little dreaming together. Isn’t that what a SAGs retreat is for? 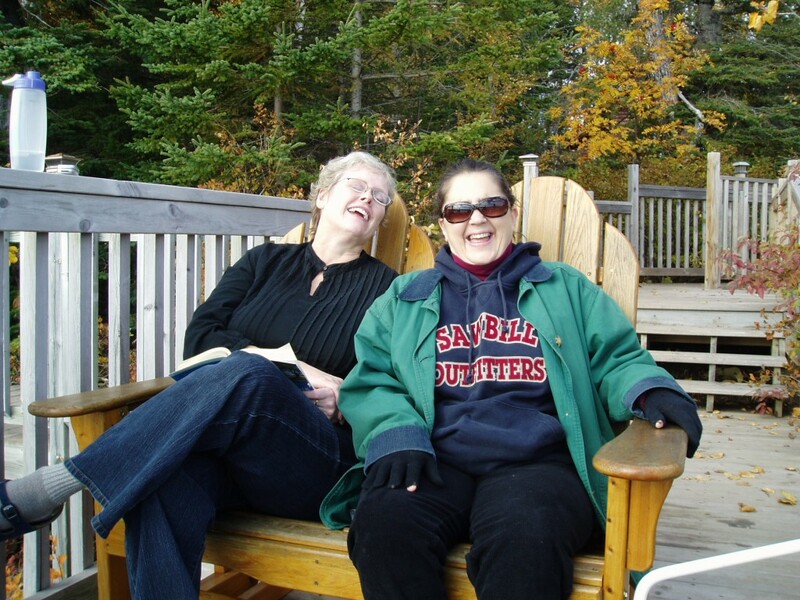 We were so grateful for our time away, we decided to mark our ten year SAGs anniversary (in 2012) with another retreat. We have a little over two years to plan. Today I checked out other cabins online that we might like to visit. 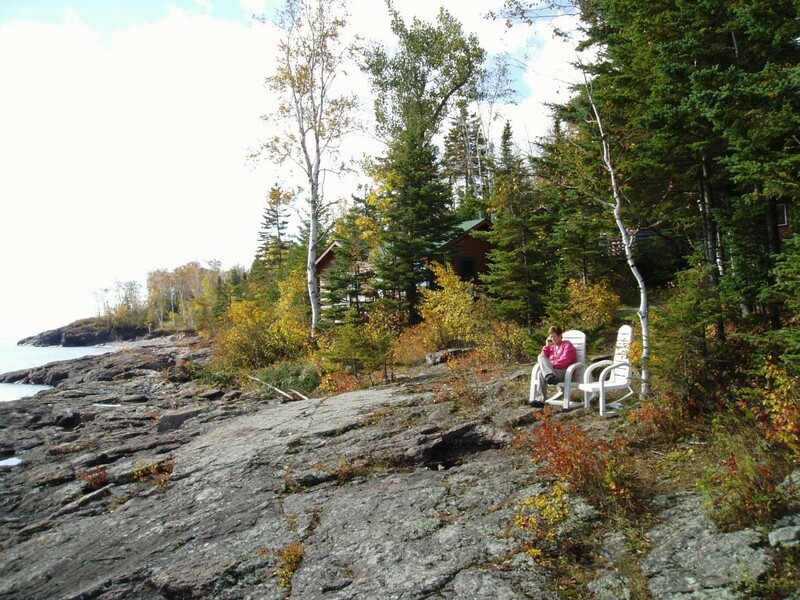 We’d like to go again in the fall of the year to enjoy the beautiful autumn colors and the chilly nights that are just right for a fire in the hearth. Vermont, here come the SAGs! So, my question is… Were you actually able to taste any of those snacks and Tom’s carbonara? okay. I thought you guys were my friends!! Why didn’t you tell me my arms looked like that!!?? I sure love you all. Yes! We tasted and tasted. And tasted.